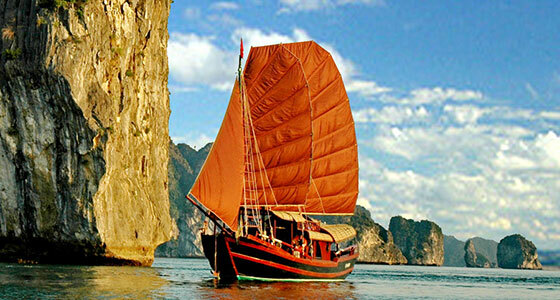 These tours take you on a remarkable journey through the whole of the Ha Long Bay World Heritage site. You will float amongst the sheer limestone peaks of Ha Long Bay and Bai Tu Long Bay whilst enjoying the luxury and comfort of this beautiful boat. As well as visiting some of the most beautiful and fascinating sites of in the bay, you will be able to relax and enjoy the onboard entertainment. You will be collected from your hotel in Hanoi's Old Quarter at 07:30 for the drive to Hon Gai Harbour. At around 12:30, a tender will take you to the Royal Wing to begin the cruise. You will be greeted with a welcome drink as you check into your cabin and begin the cruise out around the bay. A set menu lunch will be served on board as you drift past the majestic karsts and out into the bay. This afternoon, you can explore the Vung Vieng Fishing Village by bamboo boat or kayak to discover the unique way of life in this floating community. The colourful floating houses sit at the foot of the rolling green mountains, in a beautiful blue lagoon, making for some incredible photos. After, you will visit the idyllic sandy cove of Ban Chan Beach where you can relax and swim in the cool water. Back on board the Garden Bay, you can enjoy happy hour from 17:30 to 19:30 while the sunsets sleepily over the islands. There will be an onboard cooking class from 18:00 where you can master cooking some traditional Vietnamese dishes. Tonight, you can enjoy a delicious bbq dinner on the boat. Drinks can be purchased throughout the night from the luxury sundeck bar. The boat will be anchored overnight in the Cong Do area. You can greet the new day with a refreshing Tai-chi class on the sundeck from 06:30 to 07:00. Watching the sun rise over the thousands of islands will fill you with wonder for this magical bay. A buffet breakfast will be served from 07:00 followed by a visit to Thien Canh Son Cave to explore the labyrinth of stalactites and stalagmites. On your return to the Royal Wing, you will check out of your cabin and have time to relax on the sundeck or watch a fruit carving demonstration. You will have one last chance to soak up the stunning sights of the bay as you enjoy an early lunch while the boat cruises back to shore. 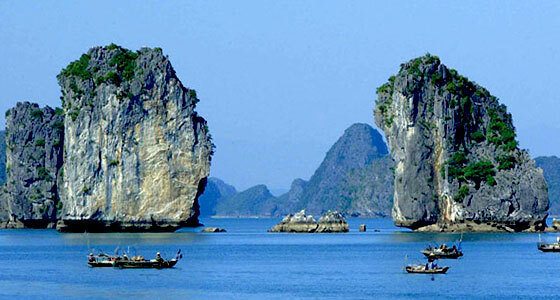 After disembarking, you will begin the drive back to Hanoi, arriving at around 17:00. You can enjoy the sunrise with a Tai- chi class on the sundeck from 06:30, the perfect way to greet another fantastic day of exploring. A buffet breakfast will be served from 07:00 before transferring to the day boat. Today, you will have the chance to try your hand a fishing with some local fisherman. After, you will return to the boat day to relax and take in the views before having a delicious seafood grill lunch. 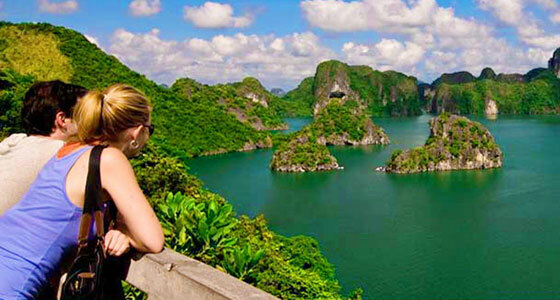 You will then cruise to the Vung Ha area where you can explore on kayaks or swim in the cool, clear waters. You will return to the Royal Wing at around 16:00 where you will be free to enjoy the evening at your leisure.